The Fellowship was fortunate enough to obtain a copy of ROM #5 from IDW Publishing. The story is by Christos Gage & Chris Ryall, with pencils & inks by Paolo Villanelli, colors by Alessandra Alexakis, and letters by Shawn Lee. Rom returns to Cooper’s Mill to reflect the recent events involving the Autobots and G.I. Joe; plus the fact that the Dire Wraith infestation is worse than he thought. He lands at Darby Mason’s family home to recoup, but encounters Camilla who is losing the battle with a Wraith for control of her body. While Rom fights for the life of a friend, he gets some unexpected help. That’s a good thing, isn’t it? Meanwhile, JOE member Beachhead doesn’t like the truce between the humans, Rom, and the Transformers. He makes a dangerous decision which could be a threat to that truce. Five issues in and the ride is still enjoyable. If you didn’t read the REVOLUTION crossover event, enough information is given to you so you are up to speed. Gage & Ryall keep the action going while throwing in enough mystery and intrigue to make this more than popcorn read. Nice work by Villanelli and Alexakis makes this a fun sci-fi action adventure book. Check it out. 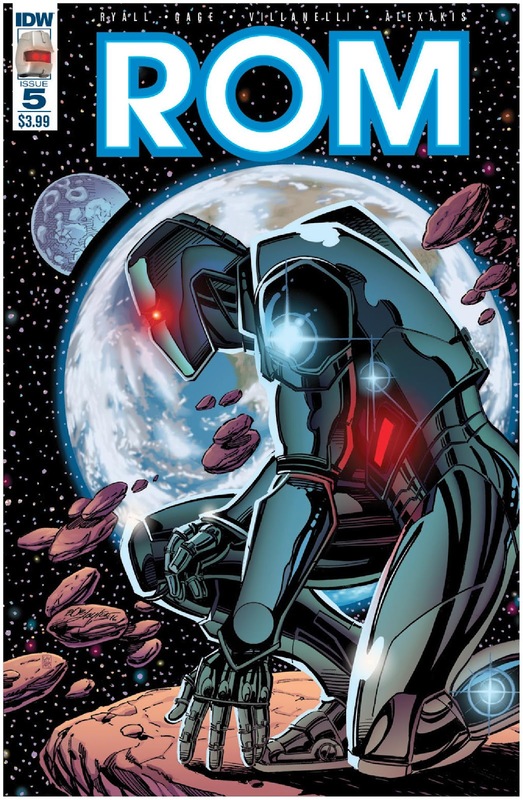 ROM #5 is in stores now or available at www.idwpublishing.com.